Buckets were traditionally used for hauling water from the well, collecting milk from the cow, or carrying feed for the livestock. 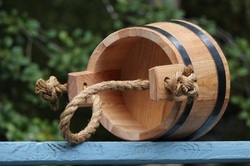 Sailors used them for water to swab the deck and to hold tar for the ropes. Miners used them to haul ore. Full of liquid, buckets can weigh close to 25 pounds.